My name is Christina Cole. I have brunette hair and blue eyes. I own a Skewbald paint horse named Trickster. I live on my parents' boarding, training and lesson farm. "I love you Trickster. I love you so much." I whisper, tears once again filling my blue eyes. My Skewbald paint horse, Trickster has been sick for days now. The vet says he's only getting worse. I've spent every moment, every day, every night with him since the day he came down with influenza. I take a cold, wet rag and begin stroking Trickster's sweaty neck with it. "I can't lose you." I choke, remembering my old pony, Rosy, a flea-bitten Connemara. 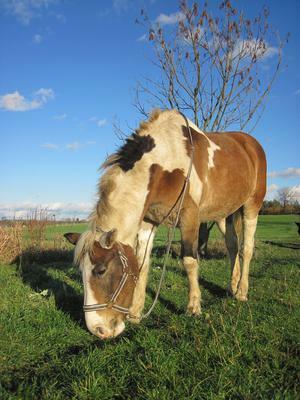 She had died of colic four years ago. I have owned Trickster for three and a half years. I cradle his head in my lap, fresh tears running down my face. I remember the words the vet said the evening before, "If he doesn't look any better tomorrow then we have a decision to make." It was 5:00 A.M the next morning and the vet was coming at 8:00. "Trickster, I need you to do something for me. I need you eat stand up or eat something." Trickster watched me as I held a handful of oats in front of him. "Come on boy, please try." He faintly nickered and slowly lifted his head from the shavings. "Come on boy, just a little more." I encouraged him my heart racing. With a cry of joy, I watched him slowly lip the oats from my hand. Placing the bucket where he could eat it, I raced from the stall and up to the house. My parents were just about to come out to the barn. "Mom, Dad! Trickster is eating!" I shouted racing towards the barn, my parents behind me. I suddenly halted in front of the stall, frozen. Trickster stood in his stall eating the grain hungrily. "You're better! You're really getting better!" I cried throwing my arms around my horse's neck. Love this story! So touching.